It’s essential to make content that’s social media sharing ready so it will be shared and engaged with. When a visitor lands on your website from search engines, how good of an impression do you make on them? Hopefully a good impression right? No matter what impression you’re making, your content must be social media sharing ready. Your visitors should have an easy time sharing your content without much thought. There are a few ways you can make sharing really easy. Making your content shareable on social media is easy to do in most cases. Hopefully, it looks good when shared too though. There are a few elements of a website that will make it easy for visitors to share your content. 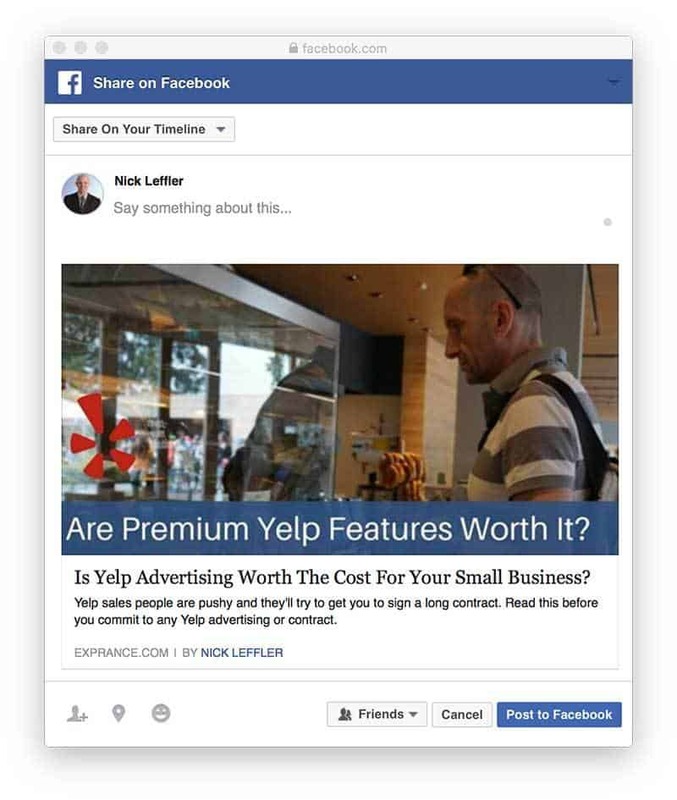 Without making it easy to share and top of mind then visitors are likely to forget to share. 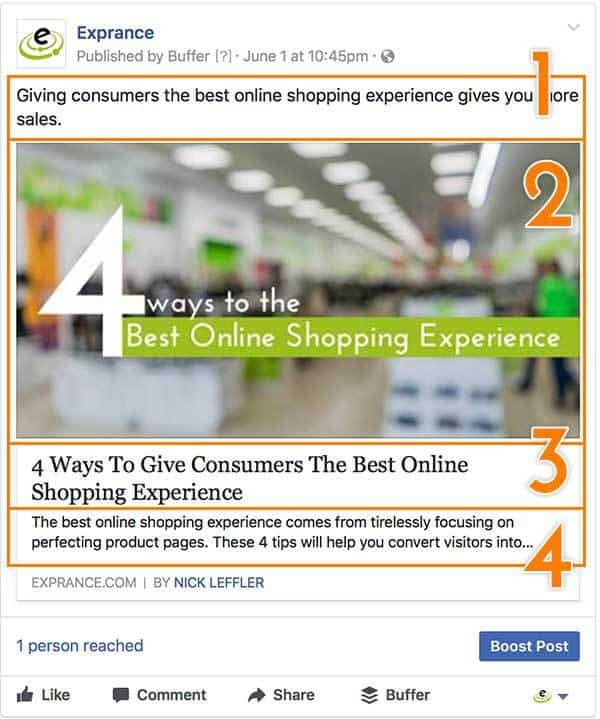 Two elements will make visitors remember to share and make it easy to share. Sharing icons are a great place to start because they’re the most popular and the most important. Many websites probably already have sharing icons but they are possible to over-do. Sharing icons are ubiquitous with most blog posts so if you don’t have sharing icons, get them. If you don’t know what sharing icons are, they’re those icons usually at the top and bottom of a blog post that allow visitors to click to share your content on their preferred social network. When someone shares your content it’ll look like this IF you configured your website properly to include a specific image, title, and description. I touched a little bit on including this information in the context of an eCommerce store but it also applies to any blog content. You may or may not be using WordPress to run your website but I’m going to assume you are because it’s the most common (and best) content management system. If you’re not, you’ll have to do your own research on ways to include nice looking sharing icons. For WordPress, there are hundreds of plugins you can use to include social sharing icons on your blog posts. Depending on the purpose of the website I’m building I may choose one or the other (or perhaps a premium plugin). I prefer AddToAny because it’s simple and lighter than Shareaholic but there is an even better option. If you really want to go with a light plugin for sharing, Social Warfare is a great option. There is a free (but very limited) version available in the WordPress.org plugin directory. There is a paid version with full features available though. With it so easy to add social sharing icons on your website it’s easy to go overboard. Social media sharing is handy and convenient for visitors. If you include too many social sharing icons on your website they can get out of control. You’ll definitely want to make it easy for visitors to your website to share your blog content and other content they find helpful. Not every piece of content on your website is share-worthy though. Are people really going to share your contact page? Or perhaps are they going to share any page? Stick to simplifying your website by including sharing icons on blog posts and product pages only. Not only that but don’t plaster them everywhere. Two or three places maximum is quite enough. At the top and bottom of each blog post or product page is sufficient in most cases. Sometimes having a share bar on the right or left side of the screen is also acceptable. That’s it, don’t go beyond those locations by including sharing icons on every page of your website. The next way to make social media sharing easy is by including an inline click to Tweet option. Making it easy for visitors to share your content on social media is only part of the battle. A bigger part of the battle is to make people remember to share your content. I read an article a while back where someone argued that social media sharing icons weren’t necessary. The argument stated something like people know their preferred social media networks and they know how to share without the icons therefore they’re unnesessary. That argument doesn’t cover why people don’t share though. The biggest issue is remembering to share and how they’re going to add value to their share beyond just blasting an article to their social following. Inline click to Tweet options remind people to share content and it gives them something unique and clever to share. It’s a brief bit of text that you’ve pre-written that visitors can click to share. A click to Tweet needs to be unique content that people will find useful to share with their Twitter following. With snippets of content presented to visitors in a click to Tweet option, they’ll remember to share and have a great Tweetable snippet. If people are going to share your content there’s more than just technical things you need to do. Sometimes it’s all about finding balance in what you write. I’m always see articles saying content needs to be skimmable for how people read on the internet. Making skimmable content is great advice but even better advice is to write for getting people to read more of your content. You want them to get your full message right? You must strike a balance between skimmable content and content that’s interesting or useful to read. Content that people WANT to read is infinitely better than content that’s simply skimmable. If a visitors want to read your content then you’re more memorable and your content is more shareable. How to strike a balance is more difficult. Writing content that people want to read takes practice and experimentation. Balancing storytelling, entertainment, and education together will help create the right mixture for great content that people WANT to read. Creating content that’s social media sharing ready and making it easy to share are important but there’s more. If you’re running WordPress then there are easy ways you can format blog posts to look great when shared. If you’re not then you’ll have some research to do. One plugin that I use to make social media sharing look amazing is Yoast SEO. What are the important parts for making social media sharing look great? Here’s an image of one of my shares that I will break down into each section. Here’s each section of the image and how it ties into SEO if done right. 1) This is the part visitors type to add their own custom message. There’s nothing you’ll do to make this look any different for Facebook shares. A click to Tweet option will pre-populate this content. 2) Your blog post image is important because it gives your blog post a great visual. It will make your shared content stand out more among other shares and is a great communication message for you. Your website won’t always choose the right image to include as your social media sharing image. That’s something that must be done manually in many cases. 3) The blog post title is an important part of telling others what your blog post is about. This determines if people on social media even want to click on the blog post. 4) The description of the blog article is helpful for those that really look deep at the content before clicking. This is the perfect place for you to really sell your content and make people want to click on it. Each of these sections is important and they all are necessary to maximize social media sharing. I hope you’ve gained a better understanding on how social media sharing will help you grow your online presence and reach new customers. If you’re using your website to do business then social media is a must to reach customers both locally and globally. There’s plenty to learn about social media and how to reach customers which is why I regularly write about social media. One way to ensure you have a successful online presence is to have a successful social media presence. That’s why social media is an essential part of the solutions I offer to help grow your small business online. I’m always available for a free 30-minute consultation to discuss your small business and how you can expand to reach new customers online.